Ok, back to the world. The show was a big disappointment, we were edited to make us look like we got nothing done, and here is the big surprise...it did not get picked up for another season. SO, we will go back to writing and chronicling our homesteading adventures. We may even start a youtube channel so those who are interested can watch what we really wanted to share with people; how to be more self sufficient, how to be healthier using food and herbs as medicine, and how to get back to basics. Our hope was that the show would be more educational, to give viewers the opportunity to learn along with us. Sadly, the platform was wasted and instead was produced to be a silly drama. We will keep you posted when and if we choose a new farm name and start a new website. Thinking of changing the name to reflect our updated goals, and new state! At some point I will write about what REALLY happened behind the scenes of the show, as well as all the things that we accomplished and crazy events that they DIDN'T show you. Happy spring to all of you! First of all, that is what I call Hazel, our Nigerian Dwarf, sometimes. Second of all, I'm back! The only excuse I have is... I've been busy. Well, and nothing BIG has happened. Nothing super excited. Just storms. And fewer animals. So here are some pictures of several different things, enjoy! Oh, and the reason this started with Hazel is BECAUSE, she is 2 days past her due date and ready to pop! I am on my tip toes waiting, but you should get an update soon! Thank for reading and staying with us everybody! Sigh. Anyway, here are some pictures of some baby rabbits to keep everyone (including me) occupied while we wait. Forever. Hi, this is Caroline. I just wanted to post about my new site! It's about my new parakeets I got on my birthday, and it was a HUGE surprise for me. They are in my bedroom having some fun with each other right now, they are cute little guys. Anyway, you can read about them on my new website that's called www.thetweetykeetblog.weebly.com. Please comment also! 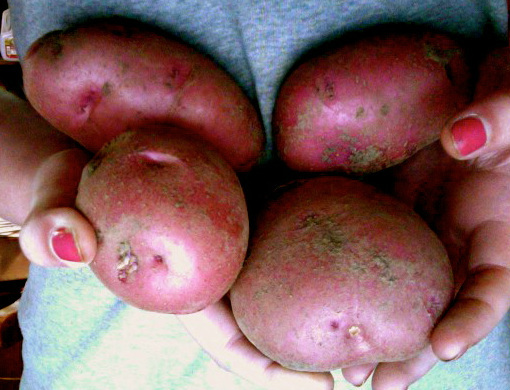 As many red potatoes as I can hold. Yes, I know, only 4. Over the last few days I have been with a friend, Sue, whom we have mentioned here on the blog before. We have been doing lots of fun things, and boring productive things. Yesterday we decided to dig up a few potatoes for dinner, which I just think is fun! We dug several up, and as I was doing it, I just felt happy. I would feel happier if they were ours.... but still, it is so great to dig up your own (or not so much) food instead of going to the grocery store. Plus it is like digging for treasure, and your sure to find it underneath all that dirt, that's for sure! Now I have dirty farm fingernails, not that it is unusual. I'm sure you noticed in the picture. It incredibly hard to keep nice looking fingernails when you live on a farm. I have taken to cutting them down to the nub every 3 days and painting them every once a month if I feel like it. I used to have nice, long, white fingernails... HA. So much for that. 1. You will never have nice fingernails. 2. You have to have bled at least once a day or you just don't get it. 3. You have to risk your life to haul a bucket of water over a cattle panel. 4. You will realize wether you are a true weakling or not. 5. You will step in a pile of sheep poop in your HOUSE... at least once in your life. Holly, my French Lop doe, will be kindling here in the next week. She will be a third timer. Hoping and expecting things to go just fine, since she has always been a good mother. But, you just NEVER know when it comes to raising rabbits. She is not tame, although I am going to have to pick up all kicking, scratching, biting twelve pounds of her here in the next few days. Why? Because she will be a resident in the nearby bathroom for a few months. Again, why? Because it is so dang hot! Excepting rabbit reservations once again. Please contact me by e-mailing billyjoesfrenchlops@gmail.com. Thanks! 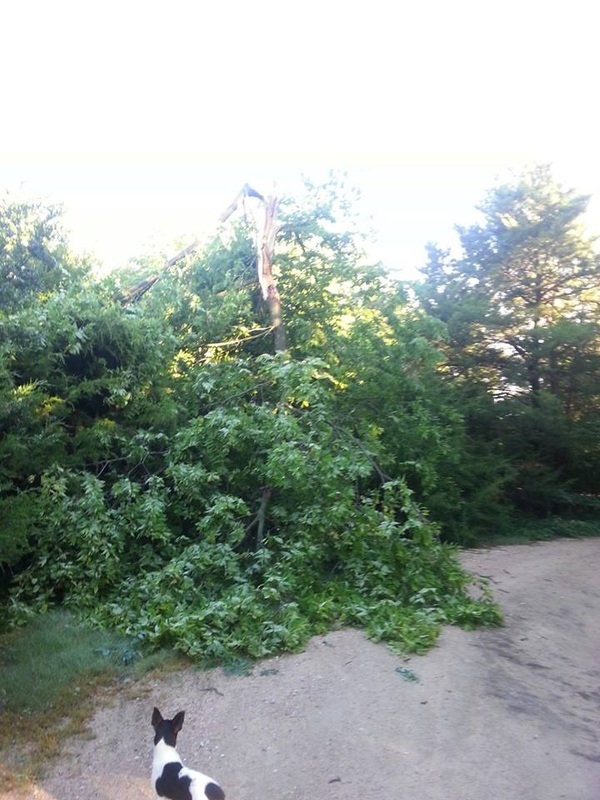 Well, that is the aftermath of the storm last night. Well, that is 7% of it. Here is the story. 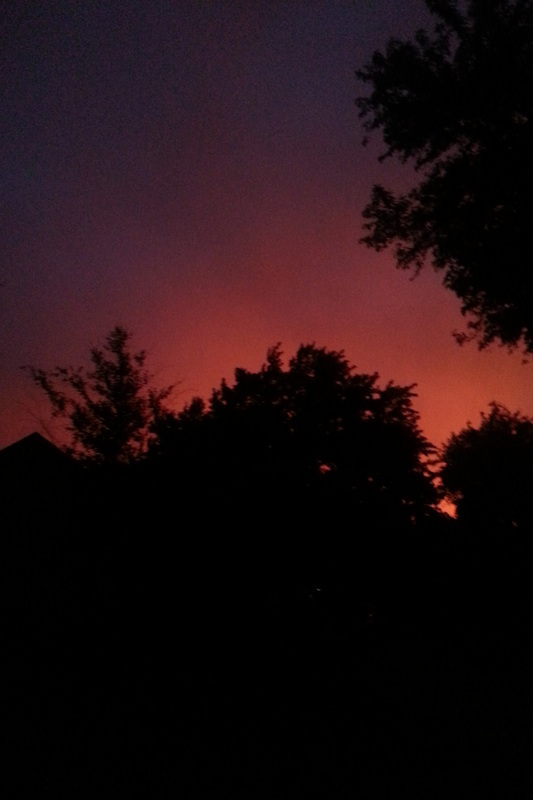 Last night, I was sitting down, and I looked at the window. The blinds were shut, but through the slats I could see that the sky was yellow, and the trees were sideways. That scared the you know what out of me. Living in Kansas, my heart always sinks when I see this. I wasn't expecting it, either. The whole day was just hot, no clouds, nothing exciting. Then it got windy. So we went out to put the animals in in case it was going to storm. Soon after that, we were getting 80 mph winds (literally, not kidding at all. ), rotating clouds, a wall cloud, trees were breaking, and branches were falling. I felt like I was in the beginning of Wizard of Oz... Goodness it was scary! So, then we were RACING to get the animals in. No one got fed besides the birds, sounds harsh, but it is better then getting killed by a branch! At this point I was running around hysterically, trying to get the HUMANS in... It was like gathering a flock of chickens! No way in my mind were they ever going to stay outside in that. So we all got in the house, and it was 7:00. Getting darker and darker. It doesn't usually get dark until about 9:00 now so this was unusual. You could her the wind blowing and it finally started raining a bit. Even in the house, you could hear trees snapping into two and branches hitting the ground. Then I would here lighting and make the TV sound go up so I couldn't really hear it... it was pretty darn SCARY, and I am obviously not a big fan of storms. After the whole ordeal, thank the lord, we and our animals were all safe. I went out afterwards and fed everyone. Everything was calm and no one was screaming in my ear. Not even ALICE... now that is a statement! So, here is what we were left with. Lots of people have asked how many animals we have, what kind, names, breed, etc. So, here is a list of our animals. ALL of them are listed, even the fish! This will make it easier for me to calculate the number, too. So, I will start. Goats first. We have so far had about 10 losses here on the farm in a matter of one month. I am so sad to say that our oldest lamb, Beady's lamb, died today. I fed them alfalfa and he started choking. They have all choked before - don't ask me why - so I wasn't too worried at first. After about 5 minutes, he continued and I was at a loss of what to do. I had no idea what to do... I mean how do you do the heimlich maneuver on a sheep? I don't even know how to do it to a human! It continued for 15 minutes before he went down. My mom dragged him out of the stall and we tried hard to save him. Tubed him, pushed on him, hung him upside down, stuck our hand down his throat, all of it. Nothing worked. He died a hard death at about 11:49 A.M this morning. I feel really bad for him. So, that is just a reminder to me that I should be happy for any life that God gives me. Even if it is to be butchered sometime in it's life, still cherish what is still here. If you have a buck year or ram year, or just a plain boy year, don't be upset. Love the lives that God has allowed you to have while they are still here on Earth. I believe things happen for a reason, and this was a learning experience. I am not happy that he is gone, no, but I loved him while he was with us. I walked out to the rabbit room this morning after I had let mama bunny out of her hutch into the stall, and my little Sweet Pea was out roaming around! Inside a pallet, of course. The hutch has a piece of wood screwed to the front, which I thought would be high enough to not let the little midgets roam around. Apparently not. Sweet Pea had jumped over the piece of wood, hopped all the way over to the other side of the stall, and squeezed through fencing into the pallet slats. That mischievous little girl. I have sold 3 does and 3 bucks. I have sold 4 rabbits out of this litter (reserved for people) and am retaining 2 for my own breeding (Sweet Pea and Mozzarella). I will be purchasing 2 new rabbits (buck & doe) in about a month and once they are grown I will have a lot more babies, a lot more often. Also, if you are interested in upcoming litters, just put your name on our waiting list and I will contact you. It is locating on our French Lop Rabbitry Website. Please no color requests, only tell me if you want a broken/solid and buck/doe. Thanks! Oh, I almost forgot! I am growing wheat fodder for the bunnies, and I just started this morning. I will make a post about it later tonight, so stay tuned!